When playing in a poker tournament, the first priority is always to remain focused on what is happening at your table where you should constantly be developing reads on the players against whom you are fighting for chips. But your success in tournaments also involves staying aware of the larger context, including where the tournament stands (players left, upcoming blind/ante increases, proximity to the money). When a tournament nears the final table — i.e., when there are only two tables left — it becomes relatively less difficult to keep track of the big picture. 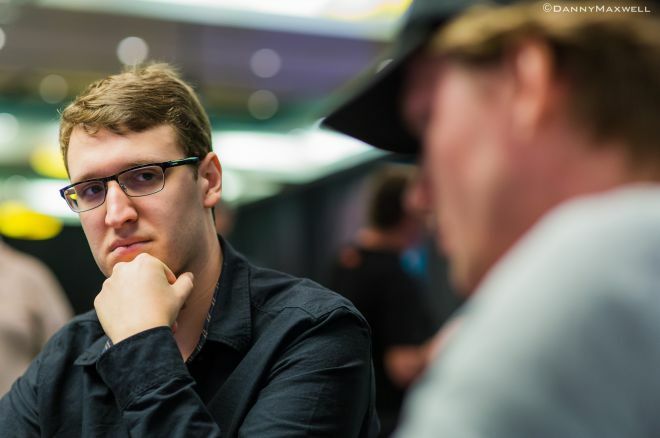 Knowing, for example, what is happening with the short stacks on the neighboring table can be of importance, as was demonstrated at last year’s PokerStars Caribbean Adventure Main Event once it had wound down to just 10 players. It was then that at one of the last two tables a hand involving Max Silver occurred that showed just how much the professional player was mindful of his surroundings. The hand well demonstrated how Silver was taking in every piece of information available to him in order to make the most informed decision at a crucial moment in the tournament. During the hand in question, 10 players remained in the Main Event and Silver was sitting with one of the shortest stacks among the remaining players. As with all European Poker Tour events, the official final table is eight players with the field combining to the unofficial final table when nine runners remain. Since there were ten players left, both tables were short-handed with five players on each. The blinds were 20,000/40,000 with an ante of 5,000. Silver raised to 80,000 from the cutoff and found calls from Isaac Baron on the button and Dominik Panka in the big blind. The trio took a flop of and Panka checked. Silver opted not to make a continuation bet and checked it over to Baron. Baron fired out 135,000 and Panka got out of the way. Silver called. Fourth street was the and Silver check-called another bet of 260,000. The then completed the board and Silver checked for a third time. Baron announced an all-in bet, which was actually a bet for Silver’s tournament life of 720,000. Silver went into the tank. As Silver thought about what to do, he noticed another key bit of information — something not even happening at his table. Silver saw that at the other five-handed table Tom Hall was already all in and at risk before the flop against Madis Muur. Ultimately, at that table, Hall’s was unable to best Muur’s and Hall was eliminated in 10th place. Silver correctly waited to gauge the outcome of Hall’s all-in confrontation before returning to thinking about the situation at hand. After another moment of thinking, Silver opted to ditch his hand and the field then combined to the unofficial final table of nine. A key piece of information here is that there was a considerable pay jump from 10th place ($112,400) to 9th place ($135,400) — a difference of $23,000. Not really chump change, and in fact more than twice the buy-in for the $10,300 Main Event. This was an instance in which Silver was given the opportunity to analyze the situation given an extra bit of information. If Silver was sitting on a marginal decision in terms of making a call for his tournament life, the information about Hall, the pay jump, and the upcoming redraw could have all factored into his final decision. If Hall had called and doubled up, that would mean Silver would still be playing five-handed at his table and would certainly be representing the shortest stack in the tournament. However, by waiting for the conclusion of Hall’s hand, Silver was able to make a much more informed decision. Hall’s elimination meant that Silver was guaranteed more money even if he called and lost because he began the hand with more chips than Hall had at the start of his hand on the other table. Let’s say that Silver was getting particularly beat up during short-handed play. Knowing that Hall’s elimination would mean a redraw to a table of nine, Silver could then release his cards and hope to find a better spot at a nine-handed table rather than calling off in a marginal spot five-handed. While Silver did eventually bust in ninth place as the official final table bubble boy, this moment of gathering in every bit of information from the tournament still showcased Silver’s aptitude as a player. Being mindful of your surroundings is an important concept in tournament poker, especially when huge pay jumps are present.